It has being a crazy week, I was stressing out having to give my first ever presentation at the Libraries of the future seminar (with the new presentation tool Prezi !). Google decided to make things more complicated by sending me an Invite to Google Wave! I promptly gave it out to librarians I knew on Twitter and settled down to play with it. First off , it’s supposed to work in Firefox and Google Chrome. But many people have reported that it’s slow and unstable in Firefox, and that has being my experience as well, so I use Google Chrome for now. It’s still slow and not totally stable but it’s far worse in Firefox. Google wave is hard to describe, but it’s basically a Email/IM/Wiki hybrid. You “wave” to one or more googlewave accounts by adding your contacts to a new wave, similar to the way you add email addresses when emailing. If people you have on your google contacts have a wave account they automatically appear as one of the possible contacts. The image below shows me starting a new wav. Chances are though , you will have no one to wave to at first, so you have to figure out what their wave addresses are, or find some public waves to interact in. Like email conversations, you can usually only read waves you were added to as a contact. It is however possible to make a wave “public”, so anyone with a wave account can read it (see this on how to make a wave public). The interesting part is that if the people you wave to are online, you can see them type their responses in real-time and by real-time I mean you can see them type their responses letter by letter! You can also respond in real time, so you can respond mid-way even before the other party has answered. It’s a novel experience, particularly if you have not used real time collaborative tools like Etherpad or Googledocs before. Each wave you see would include a threaded history of the conversation so far, and you can add new people to the wave at any time, and they would have access to the whole conversation. When you view any wave that has changed, any new wavelet (a message in the wave) or changed wavelet (see later) will have a green border around it. You can click on space bar, to quickly jump to these wavelets. There is also a “playback” mode that allows you to see how the wave changed with time, who added new wavelets etc. An interesting twist is that the messages you type as well as those added by others can be edited/revised at anytime by anybody already on the wave. This is of course based on the wiki concept, with similar history tracking features. Google Wave also makes it easy to embed widgets from IGoogle or OpenSocial gadget. But I found this really interesting extension that allow you to embed anything or html into the wave! So you can embed anything from Slideshare widgets to searchbox widgets or anything else with the correct html sniplet. Google Wave also allows you to create robots which are automated agents that respond to events in the wave to carry out automated tasks. I don’t have the programming chops to work this out yet, but here’s a interesting bot that looks for ISBN13 and replaces with a book cover. You can also embed the wave into blogs, webpages etc, but it isn’t as easy as simply copying and pasting html. In this area, Friendfeed is much more user-friendly with similar real-time functions. Mashable has a nice explanation of this and more. Google wave adds yet another possible communication tool to libraries. With libraries struggling with new communication channels such as Instant Messaging, Text messaging, Twitter, Facebook and more, it is a interesting problem to have. To me the obvious use of Google wave would be as a replacement to email. Once Google Wave becomes ubiquitous like email or gmail or if institutions implement their own Wave platforms (it’s an open platform), I suspect all libraries would use this routinely to answer queries. It has all the features of email with added functions of Instant messaging. My experience manning email library accounts is that more often then not, library users give you insufficient information to help them and you desperately want to ask them more questions in real-time. Currently I either pick up the phone and call them, or possibly invite them to a meebo chat site or use services like Tinychat. Not all of them will respond and even if they do, bringing the conversation to another location, means needing to keep track of the transaction on another communication platform (logs etc). Google Wave makes all this seamless. I’ve being racking my brain to see if anything currently done with wave cannot be done with email and so far I haven’t come up with much. Currently there are many issues with Google Wave, which is not surprising given the innovative nature of the service. I think it’s quite complicated to use, and being beta the interface needs tons of work, so much so that many people (almost all whom are geeky early adopters) are struggling with it. So it definitely isn’t ready for the masses for a long while. The main one is that I haven’t found a way to be automatically notified in a popup that someone waved to me, or added me to a wave. (The ‘Ping’ mechanism is clumsy), leading to a strange situation where people are co-coordinating with each other via Twitter/IM first before going to Google wave to communicate. For instance I have being using Twitter with @digicmb and @mlibrarianus to connect with them first before going to test wave. Somewhat interestingly, I got a wave from a library user which would be my very first ever library transaction conducted via Wave (permission granted from user). Nothing particularly interesting, at this level it works just like email, or rather gmail with threaded conversations or a normal web-based forum, particularly since we were not both online at the same time. If only Google wave could send me a popup notification of a reply, so I could respond instantly if desired. The wiki-like functions of Google Wave isn’t necessary a boon, in most cases, I don’t really see the need to allow anyone to edit everything. Currently there doesn’t seem to be any controls allowing you to turn that off, though there seems to be a provision for “read-only” messages that hasn’t be turned on yet. Also as @eagledawg on Twitter pointed out to me, while waves are private by default, anyone you include in a wave, can invite anyone else to join, there is no way to control this. These pieces were written with the full understanding that Google Wave might make all the ideas there irrelevant eventually. 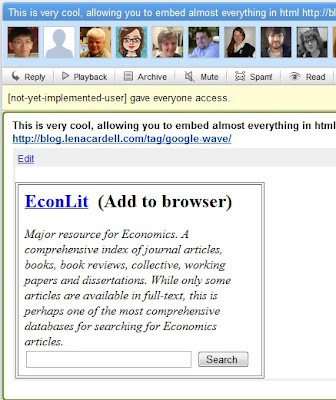 In theory Google wave could be a component of the use cases above (probably as a replacement for meebo, or Friendfeed real-time widget), or it could be used on its own. For instance the Rssybot which allows you to watch RSS feeds in wave, seems to have a lot of potential. Am I a librarian blog star? Yes, I made it to a blog “Top 100 list”! Not too shabby considering that there were at least 600 library related blogs in 2008 and should be over 1,000 by now according to this comment by Walt crawford. Granted not all are library 2.0 blogs but I’m still pleased. I also noticed a list of library 2.0 blogs on Postrank by French Librarian Julien Sicot, I adapted it and at the time I checked it was at #20 out of over 60 blogs. A much larger list of close to 600 library/librarian blogs on Postrank, ranks my blog in the 70s. Measuring online influence in general is still a very much unsettled matter. Postrank uses the 5 “Cs” of engagement. My blog posts tends to get few comments but tends to be bookmarked quite a bit on delicious and its cousins, and as I use Twitter as my main form of announcements of new posts so I get retweeted a bit. By other measures though such as Technorati Authority (which only measures inbound links from other blogs) or pagerank, this blog is truly pathetic. Feedburner shows that I have 140 subscribers to my feed, but this is inflated by friendfeed subscribers. Counting only Googlereader and Blogline subscribers and excluding exotic clients like netvibes and other clients that may be bots, I have maybe 40 subscribers for this blog, and 4 email subscribers. So yes this blog is being read but it’s not by any means widely read. Thanks anyway for those who have found my blog interesting. Hopefully I can continue to blog about things that you find useful. Feel free to comment on what you like about my blog posts. PS Yes, I know this post is self-indulgent and nobody else cares anyway. But with librarians bloggers dropping like flies , motivating oneself to blog once in a while is not a bad idea right? Mashup your Library’s Twitter, Flickr, Youtube, Facebook accounts! I’ve being thinking about how libraries can mashup their Twitter, Flickr, Youtube and other web 2.0 accounts and display them using cool visualizations. Initially I toyed with the idea of displaying rss feeds using screensavers. Software such as Nuparadigm’s RSS screensaver, RSSmore , , RSSsaver and more do this. Since Twitter can be pushed out as a RSS feed, you can display them as a screensaver on library owned machines. You can of course add more than one feed, so you can add your blog feeds, or from any service that allows RSS feeds as output (or aggregate them all using Friendfeed and use the feed there as an output). Next, I investigated web-based services. With the twitter craze out there, services such as Visible Tweets (see movie below) , Twitterverse (now down) , provides cool visualizations of Twitter tweets. The main problem with them was the same as before, they only do Tweets, you can’t include pictures or videos. This is a tool used at conferences that allows mashingup of Tweets and images from Flickr. As such it will pick up every tweet that is tagged with a chosen keyword. The background displayed will be pictures tagged with another chosen keyword. In the example above, I chose “unquietlibrary” (Creekview High School Library, a library that has being very progressive with regards to the use of Social media) as the keyword. While this works fine for picking up tweets and flickr pictures uploaded by the user account unquietlibrary, it will also pick up other Tweets and Flickr pictures by other accounts which tag flickr pictures using the same keyword, or Tweet using the keyword. This is good for conferences when you want to allow any user to contribute, but this is not a good idea if you just want to display tweets or images from your account only. Finally, I came across possibly the best solution – Flotzam! Flotzam mashups up Flickr, Twitter, Youtube, Digg , Facebook and RSS feeds and will display not just text but also images and videos. Better yet you can choose to display by user and/or by tags/keyword. For our use, we will just want to restrict results from our account, rather than by keywords. For Twitter you can even view the tweets of a user and all his friends. You can also add Facebook accounts, though you need to log-in first. I tried using my Facebook account but it produces strange random results, like pictures of my friends? More testing needed for this. You can also change various settings with regards to how many notices you see at the same time etc. There are 4 themes out there, and they are all seriously cool! So much so I embed all 4 videos using the 4 themes below. Examples are from my library and the unquietlibrary. Even better is if you can get Tetris Flotzam working (below). Unfortunately for me, it crashes whenever I try to change the settings. Do note that flotzam is quite a memory hog, and you need to have quite a powerful system and requires .Net 3.5 framework SP1 installed. One thing that I didn’t address is this. While all this is cool, what practical use can you put this too? Many libraries have large LCD plasma flat screens at various points in the library which they use to display notices (my library uses a looping powerpoint display). Seems to me Flotzam could be used on these displays, perhaps interspersed with the usual notices. 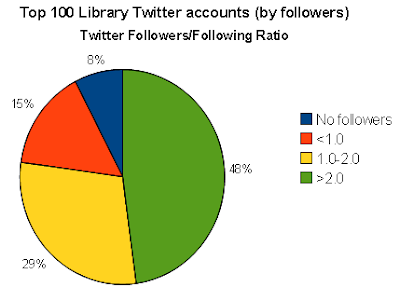 Official Library Twitter accounts- what factors are correlated with number of followers? 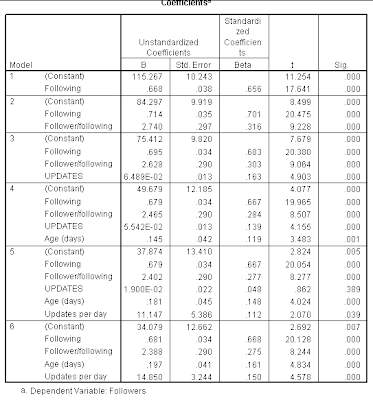 After posting about what Library Twitter accounts are doing here and here, I stumbled upon a more efficient way of getting the statistics and this resulted in the following batch of statistics (Number of followers, Number of following, Followers/following ratio, Age of account (based on first tweet) and total updates for all 456 accounts on the Library Twitter League. And as luck would have it, at the same time the Twitter League was updated and you can now, get the very same statistics as well from there! You can now order by not just followers, but also following , follower/following ratio, signup date and alphabetical. In any case, the data will be used in this post. Is the list representative of Library Twitter accounts? No doubt, many people will have questions about how representative the list is. As mentioned here ,the list began from self-reported cases from here , here and here . I was somewhat concerned that this list has an inherent bias in listing mature accounts, so I searched using Twitter search using “Lib”, “library”, “ref” etc as well as directories such as wefollow and tried as best as I could to add obvious library accounts. Nevertheless, I can’t rule out the fact that the sample here isn’t representative, though I submit that 456 is a large sample and is probably a good starting place as any. You will notice from the results above that the mean and median number of followers, 212 and 113 respectively is a bit different compared to what was reported in an earlier post (the mean was lower, but median was higher in earlier smaller sample), mainly because the composition of accounts in the earlier batch was quite different (earlier calculations had left out a few big accounts, while excluding numerous smaller accounts). A new statistic we have is the age of the account based on first tweet in days. The oldest account is 984 days old, or over 2.5 years old, making it one of the pioneer accounts. But 50% of accounts are younger than 132 days old (roughly 4 months), showing a surge in many new accounts. Above shows the cumulative distribution graph of Library Twitter accounts by age (days). 95% of library Twitter accounts have updated less than 1,000 times but this does not take into account the age of accounts. It was obvious also to calculate updates per day, and generally library Twitter accounts don’t update much with a mean update of 0.98 updates per day. The twitter library accounts generally don’t update a lot. 95% of accounts update less than 3 times daily. Note that update per day is calculated by taking total updates divided by the age of the account. Some accounts are dormant for a while before they become really active, so this statistic probably understates the current updates per day. I was curious, what the typical TFF ratio of library accounts was. Did Library twitter accounts follow everyone who followed them as recommended here? Did they embark on a strategy to proactively follow identified users and hence had TFF ratios below 1? As noted in earlier post, proactively identifying people who are your users allows and following them, allows you to proactively respond to them even if they are not directed to you, and even if they just say “library” without mentioning the name of your library. 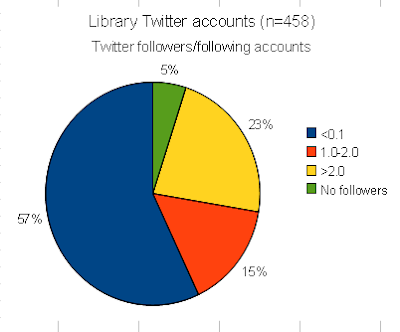 It seems that a majority (57%) of Library Twitter accounts have less followers then those following them! 5% had no followers and the rest had more followers than following. As we have seen in an earlier blog post, this result differs quite a bit when we only consider the top 100 Library Twitter accounts (based on following size) as shown below. In particularly, only 15% of the top 100, have TFF ratios of below 1 (see below). In a sense this is not surprising. The sample of all 458 Twitter accounts, includes many accounts just starting out, and they might be still in a “growth” stage or some may be initially employing a strategy of following many accounts to build up reciprocal relationships? What type of accounts are library Twitter accounts following? 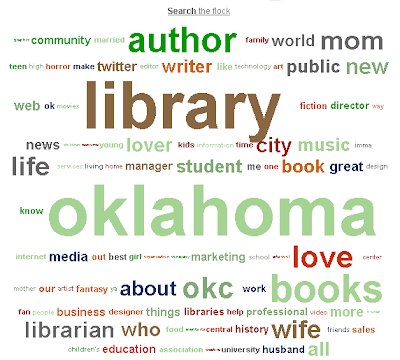 The following word cloud of the bios of the followers of a Library in Oklahma (via Twittersheep) is quite typical. Libraries Twitter account seems to be following Libraries, Librarians, writers and probably “book lovers”, and of course people in Oklahma. Another typical account showing that this Library like to follow authors. 1) As expected age of account is highly positive correlated with number of followers. Number of those following is not correlated with age. 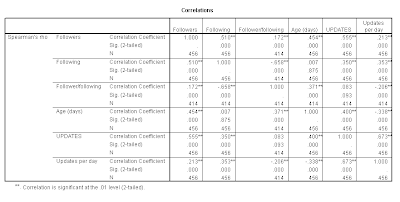 2) Number of followers is highly and positively correlated with TFF ratios. It seems to me that, at least for the library twitter accounts, larger follower accounts are correlated with high TFF ratios (low number of following relative to followers). Probably the biggest most famous accounts such as Library of Congress, New York Public Library by virtue of their reputation gain huge number of followers automatically and do not need to build up their following by reciprocal following. 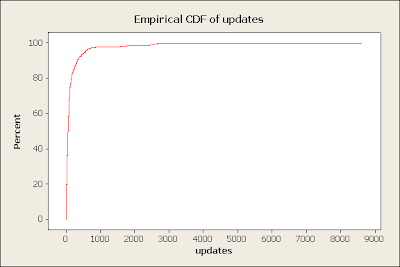 3) As expected age of account is correlated with total number of updates. 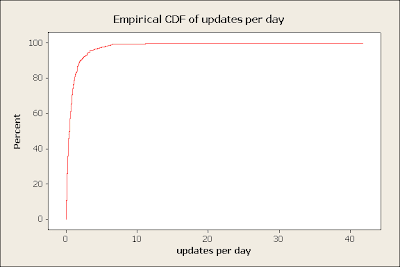 4) Updates per day is correlated with Followers and followings. Obviously there is quite a bit of co-linearity. Multi-linear regression (stepwise) was carried out with number of followers as the dependent variable, and the other statistics as independent variable. The final model, has a adjusted R-square of 0.567. It indicates that number of followers is explained by increased number of followings, follower/following ratio, age (in days) and updates per day. Is this model useful? Just putting it out there. Probably requires a larger range of independent variables. Recently, I was pondering about the need to set targets or KPI (key performance indicators) for Libraries carrying out Social media activities. Take Libraries with Twitter accounts for example, what would be a suitable target? The first thing that comes to mind is number of followers, which would be a measure of how many people you are reaching, but what would be a creditable target? One very inaccurate and rough way would be to look at the followers that other libraries have achieved (while taking into account relevant differences such as size of population served etc). Rather than creating a static list I used the TwitterLeague service , and populated it with entries from here , here and here. I had a suspicion that the lists above were biased towards successful, established accounts, as such I further supplemented them by adding more accounts. I searched for the word “Library”, “Lib”, “Reference” using Twitter’s find people service and added the accounts I found there.The full list as of May 15, 2009 stands at over 400 entries, but here’s just the top 20. The full results (which update dynamically) are available here . You can also download a xml version of the list, and view it in Excel etc. A rough calculation (this will change as I add more twitter accounts) shows that the median number of followers is 147, while the average number of followers is 260. Not surprisingly, Library of Congress is way ahead in the follower counts, more than 4 times of the next highest library account. It will probably be interesting to revisit the statistics say 6 months later to see if there are any major changes. Of course, follower counts alone probably don’t tell everything. Some accounts are just starting out, others follow a large number of accounts, which typically follow back etc. Other Twitter analytic services such as Twitter Grader , Twinfluence , Twitterholic, Twitalyzer, Tweetstats provide more sophisticated measures of influence, by taking into account follower/following ratios, % of retwits etc. The JCPR Twitter index is probably the most advanced metric available used to measure online influence. Hopefully, TwitterLeague will add more statistics, please help vote for additional features here. Given that libraries are using twitter for different purposes, I can see possible value in studying statistics such as rate of updates, signal to noise ratio (percentage of twits with links or hash tags) of accounts, Name pointing (percentage of times @ is sent to account) and more. For example, a twitter acccount used mainly for pushing service announcements would probably have a different tweeting profile compared to one that was used for reference service. I also created a new Twitter account leaguelibrary and populated it with the twitter accounts from the library league twitter list (using Twitterator to quickly add multiple accounts). I was hoping to find a way to export all the twits from this account and then carry out text analysis, using Many eyes‘s to create Word Trees, Wordle , Tag Cloud and Phrase Net. Unfortunately while I found many ways to export my own public timeline of tweets, there doesn’t seem to be a way to export my tweets PLUS tweets of accounts I’m following? Does anyone know a way to do this? I did manage to get a RSS feed of what I wanted though, and I might use this for analysis. 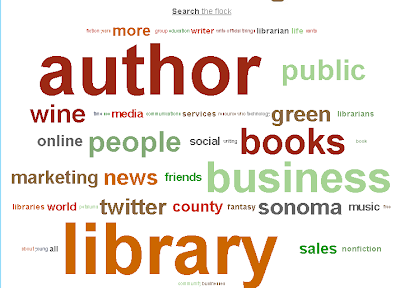 For now, I use My Twitterflock to generate a word cloud from the bios of the library accounts I’m following. In this post, I will talk about a little known service called Google Profiles, why it is becoming important, and I will describe how libraries have being using it, the web 2.0 accounts they are listing on it, and compare it to the accounts listed by libraries on Friendfeed. For years, Google had a little known feature/service called Google Profiles, which allowed users of Google accounts to setup profiles of themselves. In many ways they were similar to the lifestreaming accounts like Friendfeed, in that you listed other associated accounts such as Flickr, Twitter, Facebook, which you owned. Despite Google’s brand recognition, they have never being particularly skilled at building social networks and Google Profiles was pretty much ignored. This was until April 2009, where they placed their trump card. Two changes occured, one minor change, one major. The first change was that they allowed users to use a custom profile url, instead of a long string of numbers. For sure http://www.google.com/profiles/aarontay looks better than http://www.google.com/profiles/104559151215707191902. 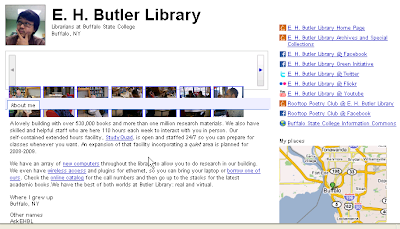 Below shows an example of a Google Profile set up by E.H Butler Library. More significantly, these Google Profiles appear at the bottom of Google searches! when you do a search. You can find out more about Google profiles here. In a previous post, I looked at Library accounts on Friendfeed (a popular Lifestreaming service) and studied the web 2.0 accounts that Libraries linked to. A very obvious idea now is to do the same for libraries on Google Profiles as well. I did a Google Profile search, by searching for the word library in the title. This results in about 162 entries. Unfortunately the vast majority of entries were blank, or had at best a link to their homepage. These I ignored on the admittedly dubious assumption that most libraries had at least a blog and accounts without blogs were Google Profiles that were not properly maintained. Moreover I noticed that one of the libraries, the Unquiet Library had both a Google Profile and Friendfeed with the later having more accounts listed. Of the remaining, I took note of the accounts they listed. Again a Google doc version of the data is available. The disclaimers I made for previous post applies here, the data above is not representative of what libraries in general are doing in the web2.0/socialmedia arena . Rather they show what libraries who have custom Google Profiles are doing. I’ve reproduced the chart showing accounts linked to in Friendfeed above. The main difference between the two charts is that compared to Libraries on Friendfeed, fewer Libraries on Google Profiles list Twitter accounts. A minor difference perhaps is that Libraries on Google Profiles tend to list more Picasa accounts for photo sharing compred to Flickr. This can be explained by the fact that Picasa is a Google service can will be autoamatically added. 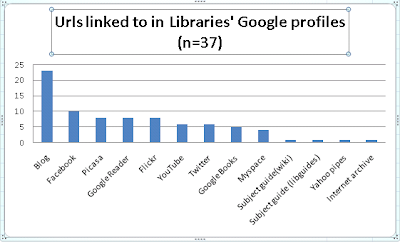 We also see libraries listing Google Books (example)and more Google Reader (example) accounts. They are quite a few innovative uses of these 2 accounts, see more from data. Unlike Friendfeed where you can only add specific accounts, or accounts with RSS feeds, with Google Profiles you are free to add any URL, and libraries have exploited this by adding links to subject guides (example), internet archive (example), Yahoo pipes (example) etc. Another difference seems to be that none of the libraries on Google Profiles list links to delicious . It’s unclear if this is a result of libraries not listing them, or the libraries not having an account in the first place. So does your library have a Google Profile ? Are you maintaining it? In my last post , I talked about libraries using Lifestreaming to aggregate all their social media/web 2.0 accounts. In particular, I talked about Friendfeed. Friendfeed is typical of most lifestreaming services in which updates from different sources will be listed one by one in a list, one on top of another. There are several such services, but perhaps the most mature and impressive one is Dipity. Below I show our NUS Libraries’ feeds will look like when fed into Dipity. It is fully interactive, you can embed it in any webpage and users can zoom in, zoom out to see more details etc. All in all, it is a lot more visually appealing then the average lifestreaming service, which shows updates one after another in a horziontal list. Dipity also offers users an option to change from “timeline view” to a “list view” . The later will display something that is similar to Friendfeed and company (see below). Just flip through each update, like flipping through pages of a book. Perhaps the most interesting one is the Map view. Map view is a bit difficult to explain. Basically in one of the blog posts one librarian reviewed a fiction book set in Italy, as a result it appears on the map in Italy, and if you click on it, it will show the corresponding post. This is a simple example of what they call geo-tagging (roughly speaking this involves tagging an item such as blog post, image etc with the geographical location associated with it). Possibly, the images don’t do full justice to the concept, go to http://www.dipity.com/Nuslibraries/ to play with it. You can also embed it as a widget on any webpage, blog or even Facebook. For more cool ideas on how to use this service you can go to their blog or just go to their Dipity homepage to see how other users are creating cool timelines. Other similar services you can try include allofme , Dandelife , Lifeblob etc. Also there is Storytlr which is close enough to fit into this category. I think time-line based lifestreaming is a very interesting way of providing a visual record of library activities over a period of time. There are some things to iron out though, like ensuring that your blog post about Library event X, and the photos on the same event X posted to Flickr account should appear on the same day etc.